Through a gift from Bob Nafis '49, the women's soccer team has been equipped with heart rate monitors over the past few years. 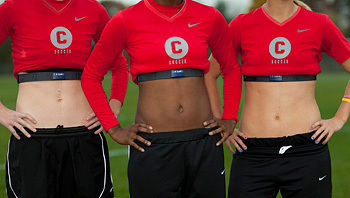 The monitors wrap around each player's midsection, just above the stomach. During her playing days with the University of Maryland women's soccer team, Danielle LaRoche, head coach of women's soccer at Cornell, did her share of running. "I had a coach that would run us into the ground," she says. "And I thought, 'There has to be a better way.'" Now, LaRoche is putting into practice the type of training regimen she wishes she had as a player. Through a generous gift from Bob Nafis '49, the team has been equipped with heart rate monitors over the past few years. The data is collected and analyzed after every game and practice, allowing LaRoche and assistant coaches Megan Ramey and Deli Sambur to break free of the outdated soccer training style that consisted of as much distance running as a cross-country team would cover. "Each monitor is specifically programmed to the player, so it has her height, weight and maximum heart rate," LaRoche says. "You plug it in, and it shows a graph of her heart rate and gives you a number of how much she exerted herself." The monitors wrap around the player's midsection, just above the stomach. It's a common sight just before games to see players wriggling the dark gray plastic bands into position as they take the field for warm-ups. The use of heart monitors is growing around the soccer world, ranging from some of the best leagues in the world like the English Premier League and Germany's Bundesliga to U.S.-based Major League Soccer. LaRoche estimated that some 100 college teams use monitors. Most Big Red players are unfamiliar with using such equipment when they first arrive. "I [thought] it was strange at first, because none of us had used them," co-captain Sidra Bonner '12 says. "But I think our fitness program is really based on them. Our summer programs and winter programs are all heart rate monitor-based." LaRoche is quick to point out that the new fitness program was the brainchild of David Tenney, a highly regarded fitness coach with Major League Soccer's Seattle Sounders. Tenney was the goalkeeper and fitness coach for the soccer teams at George Mason University when LaRoche and Allison Tenney (née Cowan) were assistant coaches with the Patriots' women's team in 2006. LaRoche and Allison Tenney applied the same principles when they arrived at Cornell in 2007. They delivered a presentation on the practice, "The Modern Approach to Soccer Conditioning," at the Coaching the Coaches conference in 2009 in Kingston, Ontario. One of the slides details how a soccer player exerts energy during a typical game: While covering about 5 to 7.5 miles over the course of a 90-minute game, players spend about 24 percent of their time walking, 36 percent jogging, 20 percent cruising, 11 percent sprinting, 7 percent moving backward and 2 percent moving with a ball. That means that more than 9 minutes of the game are spent in a sprint -- but that's only for the few players who play the entire game. For those who don't play as much, if at all, practices are more taxing than games. The heart rate monitors allow the coaches to personalize practices and maximize the effect of training for players. "They're very efficient for training, for coaches to see how hard we're working and how hard they can push us in practice and then how hard we work in games," forward Brook Chang '12 says. "Then that helps us plan our training sessions after games. Some players who played a lot and worked hard in games get more rest and vice versa." For example, a defender who spends the entire game on the field won't spend as much practice time running the length of the pitch, working instead on smaller drills like 3-on-3s. Reserve players tend to find themselves in more intense workouts during the week. The monitors also help the coaches personalize offseason training programs.